Russian human rights activists and politicians gathered in central Moscow shortly before the New Year’s Eve celebrations to show support for Article 31 of the Constitution, which guarantees the freedom of assembly. However, Eduard Limonov, one of the leaders of the Other Russia opposition movement was detained as he was exiting his home about one hour ahead of the planned start of the rally. According to the movement’s report, the police officers who detained Limonov said he was being held for organizing an unsanctioned rally and would be taken to a police station and given a lecture. But on January 1 the court sentenced Limonov to 15 days of administrative arrest for petty hooliganism. Meanwhile, another rally – issued a permit by the city’s authorities – has been held at the same spot by human rights activists. Over one thousand people gathered on Triumfalnaya Square to support Article 31 of the Russian Constitution which guarantees the freedom of assembly. The square was cordoned off by riot police well ahead of the start of the rally. Officers detained about 35 people at the entrance to the square over suspected intent to organize riots. The meeting was organized by Moscow Helsinki Group chair Lyudmila Alekseeva, Lev Ponomarev, who heads the movement For Human Rights, opposition members Sergey Udaltsov, Roman Dobrokhotov and civil activist Evgenia Chirikova – known for her opposition to the controversial highway project through the KhimkiForest. It was also attended by Vladimir Ryzhkov and Boris Nemtsov. Alekseeva appeared at the square dressed as a snow maiden, just as she did at the 2009 rally in the same place. Similar meetings were held on New Year’s Eve in 70 cities throughout the country. Former allies, Limonov and Alekseeva have turned bitter rivals over their differing views on the conditions set by the capital’s government for holding meetings at Triumfalnaya Square. For some time the two were united by the idea of supporting Article 31. 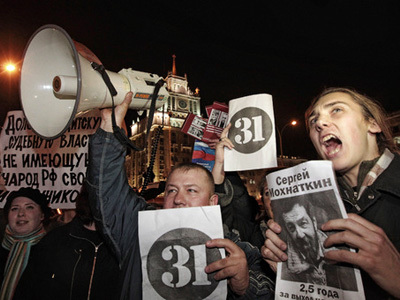 Since July 2009, at the end of each month that has 31 days, their Strategy-31 movement has attempted to stage a rally on the square in downtown Moscow. However, the organizers always failed to get official permission for the meeting exactly at the place they wanted, and gatherings were normally followed by clashes with police and the detention of protesters. 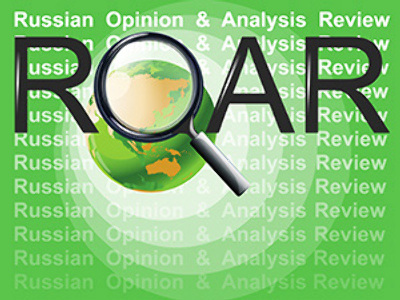 After long-time Mayor Yury Luzhkov was sacked and Sergey Sobyanin replaced him, the capital’s authorities softened their stance on the opposition rallies. But that is where the split among the Strategy-31 leaders began. For the first time ever, on October 31, the mayoral office allowed protesters to have their gathering in the square, though reduced from the number initially applied for – from 1,500 to 800. Alekseeva agreed to the conditions, but Limonov called her compromise with authorities “dishonest”. He said not allowing 700 protesters to have their say was nothing but “discrimination”. The opposition leader was particularly angry over the fact that Alekseeva decided the fate of the meeting without agreeing it with her partners. Since then the two have been at loggerheads. 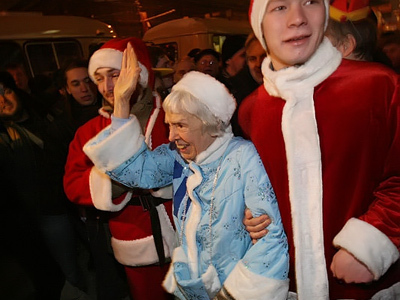 On December 16, just as the law demands, Alekseeva and Limonov each appealed for permission to stage a rally at the “square of discord” on the last day of 2010. The Other Russia leader failed to get a green light for his 2,500-strong meeting, while the Helsinki Group head obtained authorities’ approval. As an alternative, authorities said, Limonov was offered to bring his supporters together at another location or earlier in the day. However, the rebellious politician refused to accept the peaceful solution and announced he would still go to Triumfalnaya Square. Earlier, Alekseeva wrote in her blog in LiveJournal that Limonov had confessed to “despising rallies that have been permitted by authorities”. 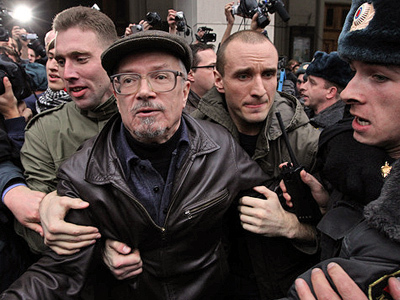 Adding fuel to the fire, Limonov reportedly appealed to radical youngsters to join the gathering. 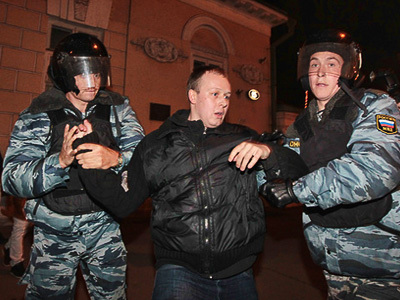 Those were the participants of the December 11 mass disorder in central Moscow. The city police said any attempts to hold unsanctioned meetings on December 31 would be suppressed. "We address our warning to all those who have any provocative or criminal intentions regarding venues that traditionally host public events and festivities. Police will act resolutely and uncompromisingly in relation to such citizens," Moscow police spokesman Viktor Biryukov said, as cited by Interfax. Everyone who violates public order or comes to mass event carrying weapon, “will have every chance” to celebrate the New Year at a police station. And that is exactly the place where Limonov was planning to spend the night. “We are fighting for freedom, so who cares about the holiday and festive dinner…Those who want to celebrate, do not come [to our meetings]. Let them enjoy the holiday with [salads] and boring relatives. 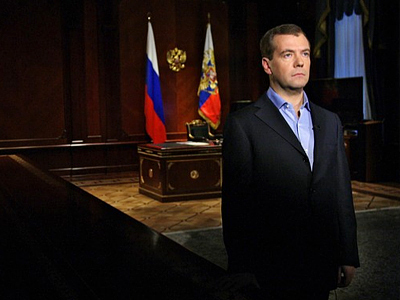 It is people who are politically ready for a fight who join us,” the Other Russia leader told RIA Novosti. He added that he was ready to be detained.